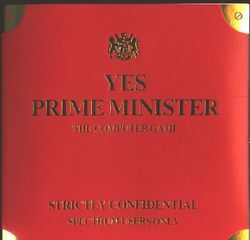 Yes, Prime Minister (fully titled Yes, Prime Minister: The Computer Game) is an adventure game that was developed by Oxford Digital Enterprises for Mosaic Publishing and released on the Sinclair ZX Spectrum, Amstrad CPC, Commodore 64, and BBC Micro in 1987; it is based on the BBC series of the same name (which ran from 1979 to 1987 and was originally entitled Yes Minister until 1984). The series was also spoofed as "Goodbye, Prime Minister" in an episode of Spitting Image in 1986. This page was last edited on 2 May 2017, at 16:00.